Although pre-production Parker “51s” were test-marketed in several U.S. cities during 1940, its official premiere did not take place until January 1941. Unfortunately for Parker, this was a very tumultuous economic and social era for the U.S. Franklin D. Roosevelt had just been elected to an unprecedented third term, the economy had been in a depression for nearly 11 years and the U.S. was preparing for possible involvement in the war in Europe. The Selective Service Act had been enacted in late 1940, requiring for the first time compulsory military service and the Lend-Lease Act was enacted in March 1941 in order to help England fight the war against Germany. Factories were gearing up for the inevitable war production to come with such involvement. All these factors combined to create an economic expansion not seen in the U.S. for over a decade. Between July 1940 and June 1941, the defense program helped corporate profits rise nearly 16%, average weekly labor earnings rose 26%, while the cost of living only showed an increase of 5%. In the Parker “51” pen you behold a history-making development. It is a wholly new departure from any pen hitherto known. It combines the best of inventive genius, engineering, and physical metallurgy. It writes with far less effort than any pen or pencil you ever tried. Whenever the Parker “51” is demonstrated, people cluster round and ply the retailer with questions. The Parker “51” was an expensive pen. Even the basic model at $12.50 was considerably more expensive than the Parker Vacumatic Maxima model at $10.00. The average weekly wage for a factory worker in January 1941 was $26.64. In 2000 dollars, the basic $12.50 model was equivalent to $148.30, while the top of the line $80.00 set was equivalent to $949.11. Coming out of a depression, initially sales were slow, and sale clerks were afraid to push the very different, expensive pen. In the May 1941 edition of its newsletter to dealers, Parker and Quink Club News, Parker decided to introduce a sales contest for salespersons and retailers. The sales contest was to last a short 6 weeks from May 19th to June 28th, 1941 and was to be called the “Parker $10,000.00 “51” Club Contest”, with two Cadillac automobiles as the grand prizes and over $7,000 in cash prizes. All salespersons received a Parker “51” Club membership button to be worn during the contest. Only salespersons could compete for the 2 Cadillac automobiles. 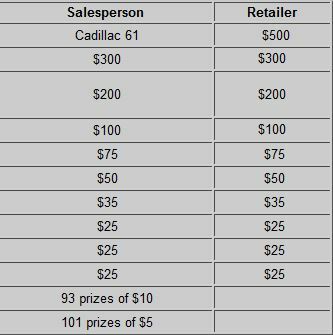 Retailers benefited from the cash rewards 1:1, and the retailer with the salesperson that won the Cadillac automobile would receive a grand prize of $500.00 in cash (in 2000 dollars, this is nearly $6,000.00). 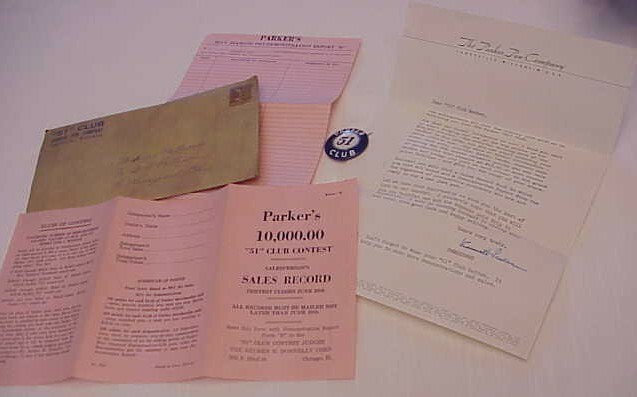 Interestingly enough, although the contest was named “51” Club, it included sales of any Parker merchandise and demonstrations of any Blue Diamond guaranteed pens. Albeit the scoring structure weighted the sales of Parker “51s” at 2:1 over all other merchandise. The short duration of this contest and early timing in the “51” product cycle, makes the “Club 51” award pens rare and desirable. All the award pens are hot stamped in the same manner in gold with Club “51” Award, including the Parker Vacumatic Major pen. All the Parker “51” pens can only have a sterling silver or gold-filled cap by contest definition. Of the 10 examples of these pens that the author has had a chance to examine, all are in cordovan brown with the lined sterling silver cap. Being an early first year contest, all pens have double aluminum jewels and probably originally came with the metal speedline filler; although a lot seem to have a plastic filler, likely a replacement over time. The hardest example to locate of these pens is the Club “51” pencil, as it had the highest level of sales required, and as is common with sets, the pencil tends to get separated or used little. I have been very lucky in locating the examples that I have. I was able to locate the pencil first. It actually was only the barrel, with no mechanism or cap. It came out of a pen dealer’s parts junk box at an east coast pen show about four years ago for all of $5.00. The Parker “51” fountain pen took a little longer and came from Ebaytm about three years ago, listed under the category for Antiques, as a “Parker Award Pen”, with a very dark, out of focus picture. I took a gamble, and was lucky to receive a very good example, at an even better price. The second example of the Parker “51” fountain pen came from another east coast pen show from a dealer’s shoe box accumulation of about 200 “51s” which I was “allowed” to look through. Another nice surprise. The Parker Vacumatic “Club “51” Award” was acquired from a well known dealer, and I actually consider it a great conversation piece in my “51” collection, as I am always asked, “what’s that Vacumatic doing in there?” Well, glad you asked, let me tell you about it..